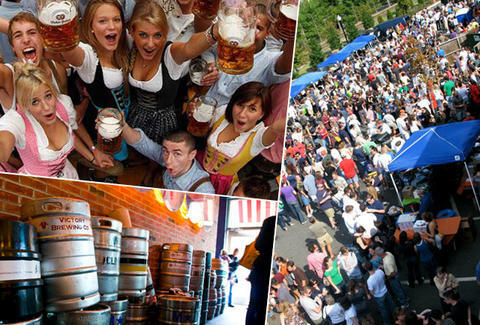 Separating yourself from the average beer festival isn't easy, 'cause then you have to go home. It's also difficult for a new beer fest to elevate itself above the rest, but next weekend's Snallygaster may just get it done. Named after a fearsome, mythical dragon-like beast, this huge, 4hr jamboree serves over 150 extremely unique and worldly brews handpicked by Churchkey's beer Buddha Greg Engert, including a few he thinks you really, really need to try: 1st Ever Bluejacket/Madd Foxx Collabs: Be among the first to taste the Freestyle #10 sessionable rye saison, and a Weizenbock called the Mad Jacket, which oughta straighten you right out. Barrel-Aged Beauties: Jump in line for the Uncle Jacob's Stout from Avery (a "gem" rarely found in the area), or have at a pair of German ladies -- the 1809 Berliner Weisse and Tap 5 Mein Hopfen Weisse, both "matured and soured in US oak barrels previously used to age Pinot Noir and then gin". Rubber- & Wood-Clad Gravity Kegs: These puppies pour pour from a spigot at the bottom, like at beer fests in Medieval days or whatever, meaning you'll be swilling better-settled mugs of Kraus Hirschen-Trunk (a smoked lager never before consumed in the US) and Nikl-Bräu Michala, which Greg recommends pairing with the also-available poutine. To soak everything up in your tummy, Birch & Barley will provide Disco Fries and Fried Piggy Tails, and Red Apron Butchery will counter with German-inspired "bacon bratwurst" and a "pork-strami" sandwich with fontina "cheese wiz", so enjoy trying to separate yourself from bed the next morning.